Rock fans, get excited. They’ve sold more than 100 million records worldwide and are currently ranked the 41st greatest artist of all time, and now Guns N Roses have just been confirmed as the second act to perform at the Yasalam after-race concerts this year. Joining the already announced The Weeknd (who will perform on the Friday), Guns N Roses will close the show on Sunday November 25. During their more than 30-year career, the band, whose members have changed several times, have released six studio albums, won a host of music accolades and completed several world tours. Most famous for their hits Sweet Child O Mine, November Rain and Patience, Guns N Roses were last in the region in March 2017, making their Dubai debut at the Autism Rocks Arena. Rock music lovers in Abu Dhabi can expect to see original members Axl, Slash, and Duff take to the stage for the performance. The band is set to release a remastered, expanded version of their debut album Appetite for Destruction: Locked and Loaded on June 29, so fans can hope that some of this material will feature in their November set. 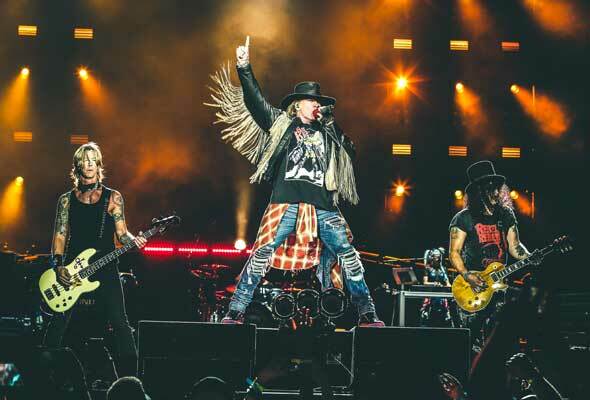 “Guns N Roses are one of the all-time rock greats, and welcoming the founding members to the du Arena to celebrate this milestone event makes it even more special”, said John Lickrish, CEO of event organiser, Flash Entertainment. This year’s race is the 10th F1 the UAE has held, and it takes place on Sunday, November 25. Race weekend will start on Thursday, November 22, with two further Yasalam music headliners set to be announced. Ticket holders for the race can also this year purchase ‘Golden Circle’ upgrade tickets for the Yasalam After-Race Concerts, which offer the best access to viewing the gigs. Prices start from Dhs195. Plus, you can get your hands on race tickets with 30 per cent discount until May 31.